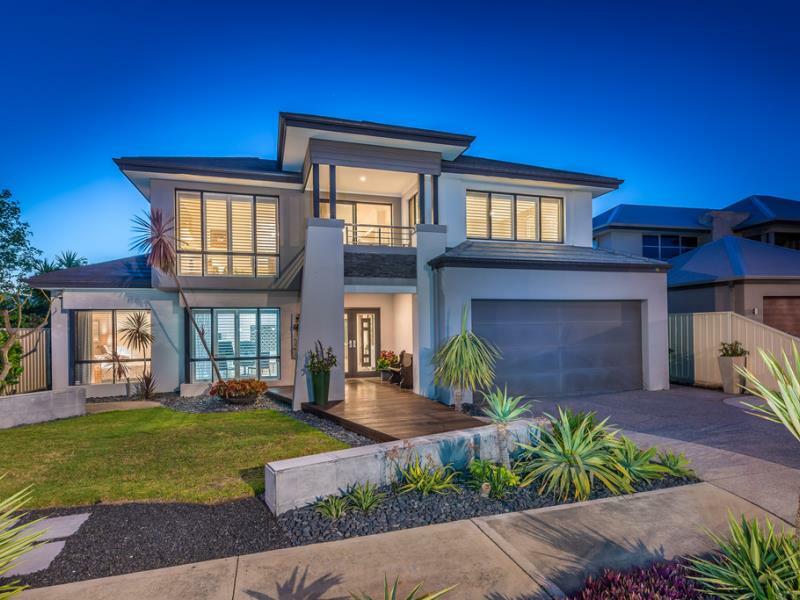 Stunning Ross Griffin built 4 x 2 ex-display home constructed in 2008. 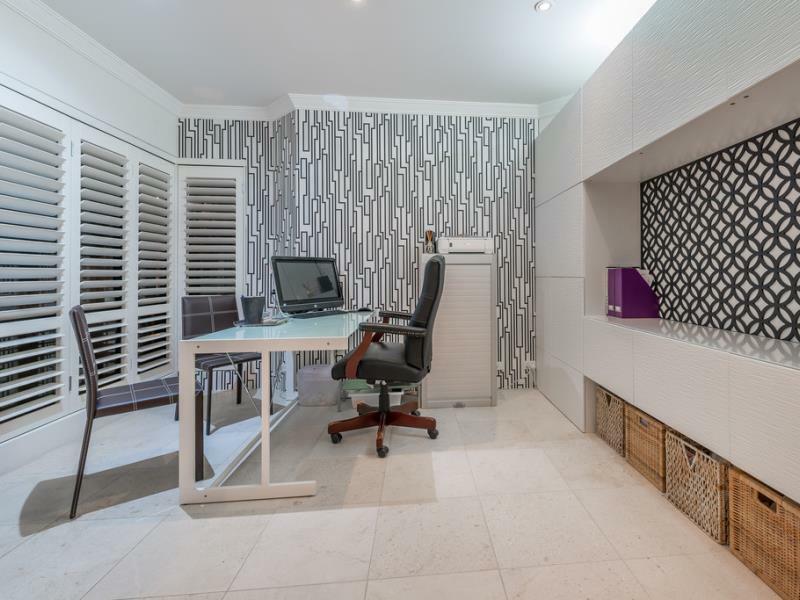 Ross Griffin Homes specialise in Luxury 2 storey property that offer the best in design and quality construction. This superb family home showcases all the qualities that Ross Griffin Homes promote in interior trends, specification and concepts. 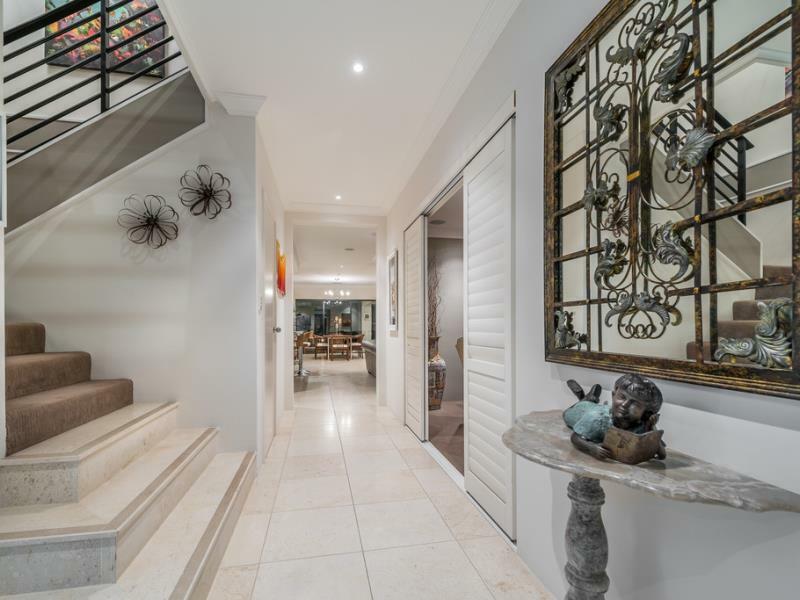 Nestled in the superb coastal suburb of Burns Beach this property is a true reward for yourself and your family in the lifestyle and opportunity that it offers. With Balcony above: DoubleHumes Illusion Entry Doors approached over feature decking . Feature Angled Staircase with powder coated balustrade. Personal shopping access from Garage. With coffered ceiling and downlights. Essa Stone working surfaces with Double under mount bench fitted double bowl. Tower tap work. Glass splashback. Range of Bosch stainless steel fitted appliances. Downlights to bulkhead. Drawers, doors and facings in Laminex classic finish. Contrasting colour and facings to cupboard kickrails. Brushed aluminium crown trim to overhead cupboards. Aluminium overhead door cupboards with mirror inserts. Walk-in Pantry. With T/V recess. Sliding glazed doors connecting with Alfresco. Dining Area: A Gallery design in its concept which maintains contact and flow with the main accommodation during colder months but is intended to fully utilise and embrace the Grand Alfresco area by the clever inclusion of sliding glazed doors to enable a full use of this spectacular area and enjoyment of our Mediterranean climate. Double coffered ceiling with Glosswood Cedar style lining inset. Feature stainless steel fronted Gas Fire. Sandstone style flooring matching main residence..
Japanese style water garden feature. Caroma vitreous china trough. Vinyl sliding doors to Linen Cupboard. Worktop with cupboards under. POWDER ROOM: Wall faced W.C. and wash hand basin. FAMILY BATHROOM: Twin Caroma Liano vanity basins; Bath and separate semi frameless glazed Shower with pivot door . BEDROOM 2: Fitted double Robe. BEDROOM 3: Fitted double Robe. BEDROOM 4: Fitted double Robe. Petite Kitchen. With Essa Stone worktop finish with Sagi inset circular sink with tower mixer ; fitted cupboards and bar fridge recess. With sliding glazed door to :- BALCONY ( 6.65 sqm)with feature pillars ; stainless steel balustrading all set under the main roof. Linen Cupboard and Upper Living area. OUTSIDE: Landscaped reticulated Gardens front and rear. Wide front driveway approach to Double Garage ( 39.50 sqm) with Danmar garage door with Perspex inset style backing. Japanese style water feature to rear with inset stepping stones. The FINISHES and FITTINGS are opulent in nature throughout with copious use of both floor and wall tiling.